The East Village has lost a legend of letters. 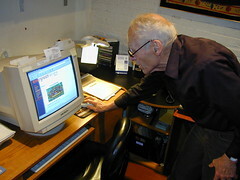 Barney Rosset, who championed avant-garde literature and defended first amendment rights as the owner of Grove Press, is dead at the age of 89, per an AP report. The crusading publisher – who more recently operated the Evergreen Review with his fifth wife, Astrid Myers, out of their fourth-floor walk-up near Cooper Square – died in a hospital on Tuesday night. As documented in a two–part profile at the Los Angeles Review of Books, the Chicago native acquired Grove, then a reprint press, for $3,000 in 1951 and sold it to Ann Getty (only to be ousted from the company) for $2 million in 1986. During that time, he published a who’s-who of cutting-edge authors, introducing American audiences to literary trailblazers such as Samuel Beckett. His list included Jean-Paul Sartre, Allen Ginsberg, Eugene Ionesco, Che Guevara, Malcolm X, Octavio Paz, Pablo Neruda, Jean Genet, Frantz Fanon, Alain Robbe-Grillet, and the Marquis de Sade, to name just a few.